Organized religion, governments, media and academics–especially archaeologists and astronomers–mock those bold enough to challenge the evolutionary model of human development with the evidence of extraterrestrial alternatives. Priests, rabbis, imams, rulers, journalists and scientists threatened by evidence in digs, clay tablets and monuments ignore or offer alternate interpretations congruent with established dogma. But now, when the collective evidence for human progress due to ET intervention is so overwhelming that the establishment can no longer ignore it, administrations, religious functionaries, media heroes and academic disinformation agents resort to ruining, pauperizing, discrediting, intimidating or even killing those who challenge the prevailing ideology. Freer wrote: “The major obstacle blocking us from peaceful species unity is religio-cultural conflicts taken advantage of by human anti-species elements [the elite] to manipulate world affairs for their own advantage. Conflicts between religions as well as the religion vs science, creationist vs evolution conflicts can be resolved due to our having recovered information to restore our history as a genetically engineered species by the Anunnaki/Nefilim, the alien species from the tenth planet in our solar system who colonized Earth and created us as a slave species to work their gold mines. 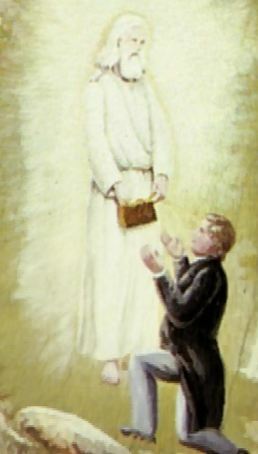 “In 1820, Joseph Smith first encountered an “angel” who returned on many occasions to repeat exactly the same message of doom and destruction among humans. The message was a recording that was replayed to him several times during the same night. It was beamed into his bedroom leaving the “angel” floating off the ground. The message ended with the floating angel exiting the window in a pillar of light until it vanished into the sky. The next day he had the same message broadcast to him by the same angel while in the field. ET s have always intervened in all human affairs. They’ve controlled us and the planet since before and since they created us. Sumerian scribes wrote that the ETs, whom they called gods, dictated the tablets and statue tags. Statues show the ETs looked like 7-15 foot Scandinavians with space-age weapons. The “gods” said an atmospheric crisis 445,000 years ago on the ET homeplanet, Nibiru, drove them to Earth for gold. Most Nibirans left Earth in 2024 B.C.. The so-called gods shaped our physical, social, intellectual and consciousness evolution. They scripted us for patriarchal hierarchy, violence, obedience and disdain for the consciousness of underlings. 445,000 ago, Ea, a Nibiran Sumerians call Enki, rocketed to Earth. 50 Medics, 600 miners and 300 astronauts and administrators followed him to Earth. They sought gold to shield Nibiru’s atmosphere. The Nibirans found ample gold in Africa and South America. Enki incited the goldminers to strike, then pressed Enlil, the Expedition Chief, to pardon the strikers and let him breed mining slaved to replace them. To make the slaves, Enki added his genes, his sister Ninmah’s mitochondrial DNA and genes of Homo Erectus. Erectus may’ve devolved from ancient human survivors on Earth long before the Nibirans. Or Erectus could be a hominid that evolved on Earth from pre-human ancestors. Ea thought the Creator-of-All designed Erectus to evolve into Homo Sapiens like the Nibirans. The hybrids Enki created–we Homo Sapiens of today–looked like short versions of the Nibirans on Earth. Most Nibirans stood seven or eight feet tall and had longer heads and bigger brains than we have [Sitchin, Z., 2010, There Were Giants Upon The Earth, pages 294 -347]. Male Nibirans lacked the foreskins of our males. Enki created our ancestors. He and the Nibirans begat babies with each generation of slaves. They trained the slaves to mine gold and copper. Slaves tended the ETs’ crops, livestock and mansions. After the Deluge 13,000 years ago, Expedition bosses told slaves to call them “gods” and build them temples, palaces, hangars and cities in Sumer (Iraq). Nibirans taught slaves astronomy, mathematics, agriculture, herding, writing, architecture and geology to support the cities and palaces. The Nibirans owned and controlled the Earthlings. Enlilites, gods of Sumer and India descended from Enlil, sent slave armies against Enkiites, the gods of Africa. The pushiest Enkiite, Babylon’s god Marduk and his demigod son Nabu raised fifth-columns in Canaan and sent slave armies to take the Sinai spaceport from the Enlilites. In 2023 B.C., Enlilites nuked the Spaceport to keep it from the Enkiites. Fallout from the bombs spread to Enlil’s Sumer but not Marduk’s Babylon; Babylon nestled safely north of the deadly cloud. Sumer’s Enlilite gods fled, but their slaves died. Marduk ruled Sumer for awhile. The heirs of the gods hide our ET/Homo Erectus breeding and chain us in matrices of religion, war and business to think that one of the ETs is the Prime Creator. We manumit ourselves when we examine the Sumerian account of our history and reject the mind-set of the patriarchal and genocidal Nibirans who pose as God. When, in 1393 B.C., Israelites captive in Bablylon, wrote Genesis, they fused well- known writings of how Enki, Ninmah and Thoth made us and thwarted Enlil. Bible writers spun the tale to justify a national religion that glorified Enlil–the Nibiran Expedition Commander, who forbade us reproductive ability and wanted us all drown in Noah’s flood–as Yahweh, the one and only god. The Bible’s compilers “make Enlil their single monotheistic deity. Religious, military and political controllers “suppressed the knowledge about the alien presence.” The Old Testament called god Adonai (Enki) when he did good things to or for the Hebrews. When god murdered, Bible writers called him Yahweh (=Jehovah, alias Enlil), whom they worshipped in fear. They “sublimated Enlil–a disagreeable, harsh, peevish individual, cruel toward humans–into a cosmic being. Contrary to Genesis, literature written 4000 years before the Bible’s propagandists made their spin on the tale, Enki, his son Ningishzidda, and half-sister Ninmah, created our Nibiran/Erectus hybrid ancestors to resolve Nibiran astronauts’ strike in the goldmines. The hybrids replaced the astronauts in the mines. Each generation, Enki mated with the prettiest females born to the hybrids; he multiplied the ratio of Nibiran to Erectus genes in our stock. He gave his part-Earthling son Noah a computer program that showed him how to build the submersible to save the bloodline and to save and rule humanity.